During their most recent lesson, I made a cup of tea and joined them. I was amazed with what I saw. Val broke down the game into many mini-lessons. Set Up: Val created a paper chess board, and put a queen figure on it with lines showing the directions the queen can move. He then got out the wooden board, the white queen piece, and 6 black pawn pieces. He set the queen up and put the pawn pieces on random squares around the board. Pick up the queen piece, and let the child handle it. Point out the crown. Show the square where the queen usually starts. Demonstrate the ways the queen can move- first using the pieces on the wood board, and then on the paper board. Leave the paper board out as a guide. Put the queen on the wooden board, with the pawns placed throughout the board. Ask your child which pieces the queen can capture in one move. 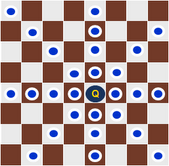 Then, point to each piece, look at the queen, and together move the queen to see if she can take the pawn in question. If so, our son grabs the piece off the board. They do this for every pawn. 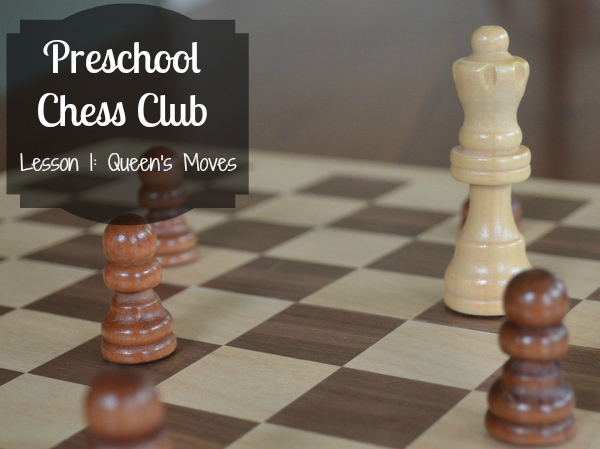 Once your child gets the hang of how the queen moves, let your child set up the next few rounds, scattering pawns wherever he or she likes. The child then checks to see which pawns are targets for the queen. If our son is unsure, they refer to the paper chart showing the movements, and more often then not, our son comes up with the answer. After they’ve had enough, they move on to chess pretend play, using the names of the pieces as inspiration. Knights guard castles and battle alongside kings and pawns in imaginary battles, with pieces diving off the table. I have to say I never realized the sound of chess was laughter.